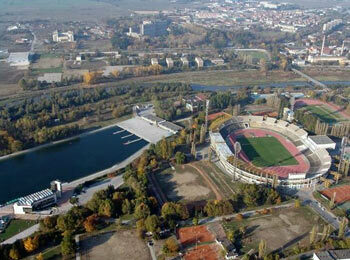 also of the Plovdiv stadium with 70,000 seats. The Australian selectors were pleased with their selections for this event with quality crews being selected. These included the Australian senior pair which doubled up at these Championships. As with past years, Australian rowers studying abroad were added to this team, but unfortunately not in great numbers. The women's four contained Davis and Engel studying at Ohio State, Howe at Princeton and Edmunds at University of California Berkeley. The men's coxed four contained Croxford and Hardy studying at Harvard, Snelson and Cleary from University of California Berkeley and Copolov from Northeastern. Jack Kelly from Harvard also raced in the lightweight single. They trained togrther in a camp at Dartmouth College. There were a number of athletes returning to the U23 side this year including Hamish Parry and Jack Armitage (BLM2-), Katrina Werry and Addy Dunkley-Smith, who last year competed in the U23 Women’s Eight, combined to race the U23 Women’s Pair. Luke Letcher also returned, but this time to race in the U23 Men’s Double Scull with Tom Schramko who recently made the step up from the Junior Australian Rowing Team. Unfortunately Cara Grzeskowiak was injured during preparations and was replaced by Leah Saunders in the women's quad scull. In the U23 Coxed Four the Australian crew had a tough race and straight out the blocks it was Italy, in second, who began putting on the pressure on the other competitors after passing the half-way mark, gradually overlapping and then steadily taking over the New Zealanders. In third it was Australia, with Turkey, in fourth, not giving the Australians any peace of mind. With 500m left to go, the Turkish crew pushed past the Australians, while Italy continued storming ahead, with New Zealand chasing hard. In the final strokes, Germany came out of nowhere, moving up from sixth at the half-way mark to surprise Turkey and finish five tenths of a second ahead, with Australia finishing in fifth place. The RA website reported as follows: Addy Dunkley-Smith and Katrina Werry snapped up a bronze medal in the A-Final of the U23 Women’s Pair. The pair, coached by Simon Gadsden, were up against the USA in Lane 4 who as expected started fast to take an early lead and were closely followed by Great Britain in second with France pushing for third. The Australian crew was in fifth by the halfway mark and needed to dig deep to make the podium, and that they did. The Victorian rowers pushed hard in the final 500 metres challenging both France and Great Britain for the silver and bronze medal positions, and as the French lost speed the Australians took their chance and surged through to take the bronze as Great Britain held onto silver and the USA took home the gold. In the final of the U23 Women’s Four, Australia had been drawn in Lane 3 having had the fastest qualifying time. However, the USA had a point to prove in the race having qualified through the repechage. The Americans led the race while the battle for second and third ensued between Australia, Canada and Great Britain. Ultimately the Canadians and British won out, taking silver and bronze with Australia coming in fourth.